Beijing: An increasing number of Indian students are coming to study in China, mostly in the medical field, while the number of Chinese students studying in India is holding steady, media reported on Monday. According to China's education ministry, India has in recent years remained one of the top 10 sources of international students in China, China Daily reported. Last year, 13,578 Indian students were studying in China, compared with only 765 a decade ago. Eighty percent of them were following undergraduate clinical medical courses in different medical institutions in China, the Indian embassy in Beijing said. The second most sought after course for the Indian students is Chinese language and culture, the embassy said. Bhawna Bhatnagar, 26, who is studying Chinese at Beijing Language and Culture University, said she has a lot of interest in Chinese culture. "And, as Indian and Chinese civilisations are two of the oldest in the world, it's interesting to study them and learn the similarities and differences," she said. Studying courtesy the support of a Chinese government scholarship, Bhatnagar said she was happy overall with her studies. "I am satisfied with the scholarship, which I think provides most of the things I need to live here comfortably," she said. Another woman from India is studying Chinese language and literature in China as she wants to learn the language in its native country. "Just as a Chinese proverb says: Seeing once is better than hearing a hundred times," she said, adding that her study and stay in China had been a wonderful experience, and she would like to have a job related to China in the future. 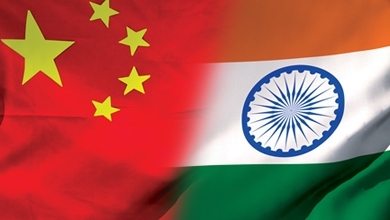 The number of Chinese students in India has remained steady, but "very low", at about 2,000 for the last few years, according to the Indian embassy. A majority of Chinese students in India are studying at undergraduate levels in diverse subjects, with Hindi language being a favourite. Zhong Jiacheng, a student from China's Jiangxi province, is studying e-commerce at India's Vellore Institute of Technology. The 21-year-old said many Chinese students are unwilling to study in India because they think the social environment there is not very safe, especially for female students. "In fact, it's OK, not as bad as people imagined," Zhong said, adding that there are about 40 Chinese female students at his university. What attracted Zhong to India were the low expenses, the English environment and the culture. "My annual expenses here, including the tuition, the living expense, and everything, is about $5,000. It's much cheaper than many other English-speaking destinations for overseas study," he said.